The face of Papa John's is being sliced out of its ads. The pizza chain is removing John Schnatter's face from its marketing materials, two days after he admitted to using the N-word during a company conference call. 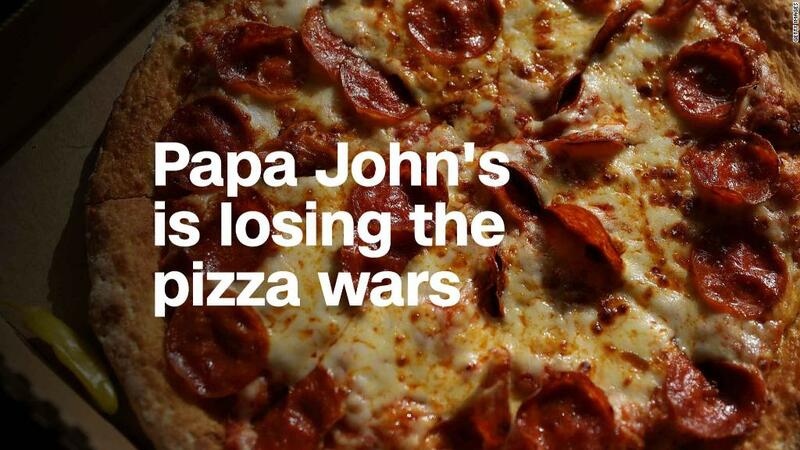 The Associated Press first reported the news and a Papa John's spokesperson confirmed it to CNNMoney. Top executives decided to remove Schnatter but details are still being worked out. The source told the AP they were "not aware" of plans to change the brand's name. Schnatter is Papa John's brand. He appears on its pizza boxes, in some of its TV ads and in the store's interiors. It took until Friday morning for the pizza chain to remove him from its homepage, but a version of the logo with him in it still appears on other pages of the website. Schnatter left the chief executive seat at his namesake company in December last year amid a string of public relations debacles and slumping sales. He stayed on as chairman until earlier this week, when he resigned from that post in response to the latest scandal. On Friday evening, Papa John's CEO Steve Ritchie posted an open letter promising the company would take steps to "rebuild trust from the inside-out." They include hiring an independent expert to audit the company on a diversity basis, and deploying senior management to hold listening session with rank-and-file employees. "Racism and any insensitive language, no matter what the context simply cannot -- and will not -- be tolerated at any level of our company," the letter said. Papa John's (PZZA) stock the trading day flat on Friday. — CNNMoney's Jackie Wattles contributed to this report.